By the Munich Painter, Amphora 2306. Height 43.5 cm. Saint Petersburg, The State Hermitage MuseumInv. No. Б. 1565 (St. 1639, Б. 602). Heracles fleeing with the Delphic tripod. Inv. No. Б. 1565 (St. 1639, Б. 602). Side A: Heracles fleeing with the Delphic tripod on which the Pythia uttered her prophesies. After murdering Iphitos, son of Erytos, he came to consult her to absolve himself. She refused him a reply. Side B: Apollo, wearing a chlamys (mantle), pursues him to defend his oracle. The circular field which contains this composition seems to add vigour to the pursuit. Heracles looks behind him and Apollo stretches out his right hand towards him in the desire to recover his tripod. 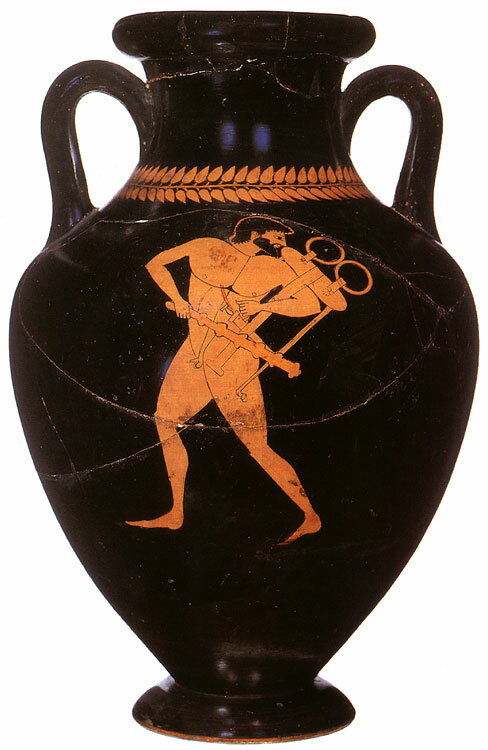 Heracles’ chest muscles and head are rendered in great detail. J. D. Beazley, ARV2 (Oxford, 1963) no. 2 p. 226. A. A. Peredolskaya, Krasnofigurnye Atticheskie vazy (Leningrad, 1967) no. 28 p. 34, pl. XVIII. © 1993. Photo, text: Olympism in antiquity. Olympic Museum Lausanne. Bertelsmann UFA. Industria Gráfica S. A. Barcelona, 1993, p. 68 cat. no. 11.